And I'm late! I'm afraid a last minute offer of a friend's house up on the North coast for the weekend took priority on Friday. We had a fantastic couple of days watching huge waves and walking in the gale force winds. It certainly changes the dream a of a house right by the sea...I'm going more for a 100 yards back and a slight incline now. 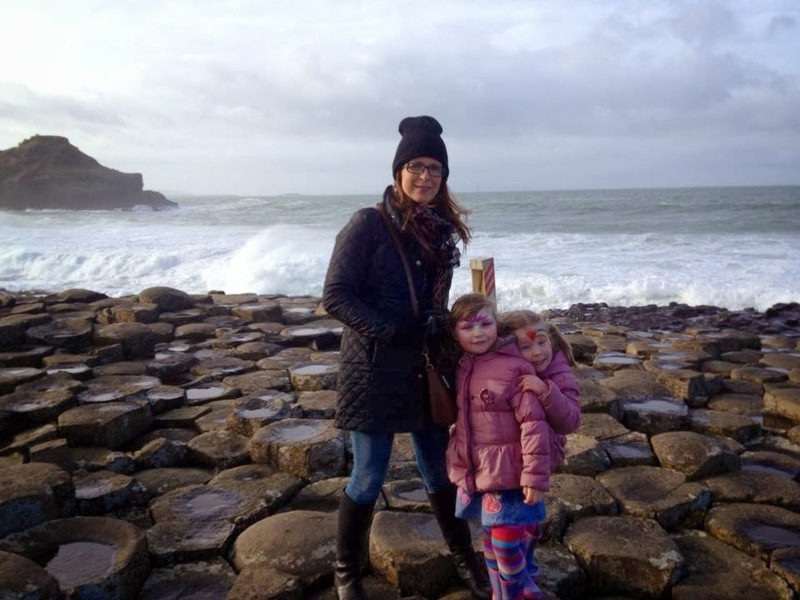 Here I am with my girls on the Giant's Causeway - holding on to them tight as it was so windy and the occasional wave was managing to make its way up onto the rocks quite close to us! Back home now and back to the challenge at hand. February is one of two Frugal months during 2014's year of style challenges (see how I sneaked that second one in - it's ages away, I promise). It simply involves not buying clothes for 28 days and instead making the most of what is already in your wardrobe. Are you in? I'm hoping lots of you will get involved and I promise not to tempt you too much with bargains during the month! Everyone who manages to resist shopping for a month AND all the bloggers who get involved in the blog linky at the bottom of each of my weekly Frugal February posts, will be entered into a draw at the end of the month to win a mini hamper of lovely things, including items from my shop and other goodies I've been squirrelling away for this very purpose! So I'm kicking it off with a replica of something I wore on the blog exactly one year ago...the benefits of taking your photo almost every day. I've had to substitute the suede boots for some leather ones and take the photo indoors - both thanks to the latest storm outside..
Today's linky is below so please do share any Frugal February blog posts here. I'm also linking up with Maria for today's #realmomstyle link up. 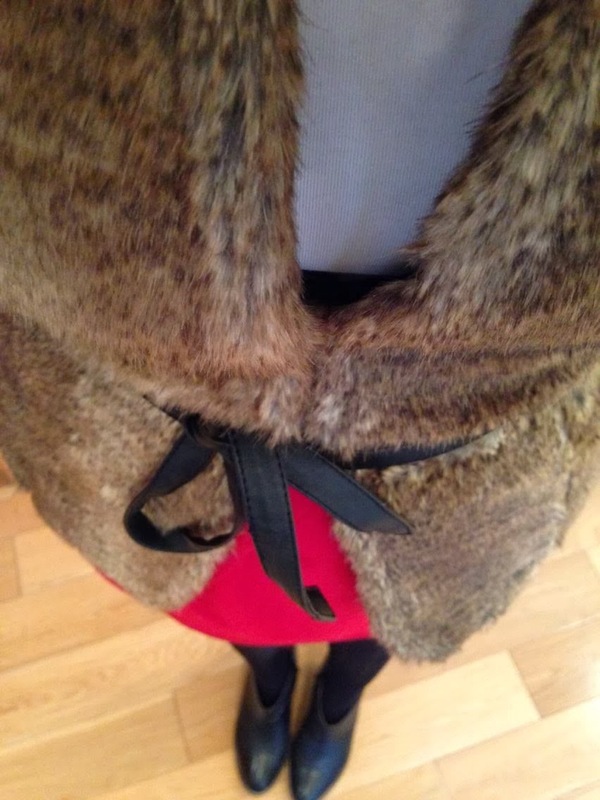 You can check out Maria's post here and add your look too! I love this outfit that fur with the red skirt is fabulous! I love the fur.. I'm still getting used to it and those booties are killer cute. So happy to be in your company for this week's #RealMomStyle! And I really dig your style, especially the faux fur! Keep on rocking it Sister! Fantastic outfit- gorgeous gilet!!! Looks great with the red skirt. I've never felt bold enough to wear fur, but it looks chic! We only visit the Causeway twice a year or so. I recall having a bracing picnic there during March one year, certainly blows the cobwebs away! PS attempting to be frugal but tempted to buy some swimwear for summer hols before all the best bits disappear. Ooo! I like the sound of your challenge! It's something I should do I think so perhaps I'll join in!! I've not bought clothes this month so I can qualify I think! Which coat are you wearing in the Giant's Causeway pic? Me likey!!! Wowza! That fur gilet is just gorgeous! What sold it for me was the red skirt and the tie it has in the front. It has just the right about of femininity and not gaudy at all (you know how those BIG fur coats and gilets can look). Simply stunning! Thank you very much for linking with #RealMomStyle and we hope to see you again next week. All the best from Washington, DC! That vest is just lovely! I'm visiting from the Real Mom Style link up! Very cute outfit!